Cast: Dennis Quaid, Forest Whitaker, Matthew Fox, William Hurt, Bruce McGill, Sigourney Weaver, Eduardo Noriega, Edgar Ramirez, Ayelet Zurer, Richard T Jones. Story: A presidential terrorist attack is viewed from many angles. Vantage Point gives the curious impression of trying something new while simultaneously feeling very familiar. It must be soul-destroying for a movie-maker to look outside his own industry to the mass market. He pours his heart and soul into a movie, dedicates six months of his life to perfecting his work of art, only to realise that you and I see it as just another movie - a movie that we might see if we have nothing better to do one night, but we aren't really arsed one way or the other. It'd be like lovingly creating a new cocktail that perfectly blends the aroma of jasmine with the flavour of chocolate, while still getting you delicately shitfaced, only to have your philistine clientele bolt it, belch, and ask for a packet of peanuts. It is with this in mind that I carefully describe Vantage Point as being vaguely interesting. 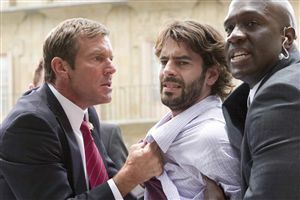 It must be much the same for Dennis Quaid. He's been in loads of movies. He's a millionaire many times over and has walked more red carpets than I've had blow jobs, but what impression does he leave on the average Joe? "Oh yeah, that guy. Wasn't he in Innerspace? What's his name again?" Same goes for William Hurt. No, he's not the guy whose exploding stomach you remember from Alien, he's the other Hurt. 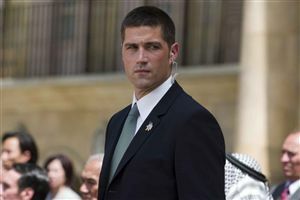 Matthew Fox (the shiny one from Lost) must be having second thoughts about his involvement in the movie, but at least he has the regulation movie good looks to see him through. Forest Whitaker is painfully underused, only having the opportunity to look lightly bewildered throughout, and Sigourney Weaver is inexplicably unseen after reel one. OK, so where does that leave us? Well, seeing the same scene over and over makes the film seem longer than it is - I couldn't believe the remarkably short claimed running time of 90 minutes, but it's accurate. Presumably to counter this impression of longevity, not one single second is wasted - everything you see moves the plot forwards - and that helps. 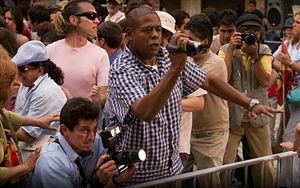 Although there is a car chase to satisfy the action junkies, it falls woefully short of the Bourne style it was clearly trying to emulate - it's nicely shot, but the editor clearly has no understanding of how to create realism in these sequences. Even if we ignore the mysterious disappearing damage that haunts many a car chase, it's still slightly less believable than a Scientology lecture. And where are the airbags? OK, Bourne 3 ignored airbags too, but I could ignore it there because the rest of the movie was so darned good and it still felt fresh after three episodes. Even though I can't remember another movie with Vantage Point's exact approach, it still feels derivative and clichéd and plays more like an episode of 24 than a feature movie. Vantage Point does reasonably well, and is undeniably entertaining for its deceptively short running time. You won't be bored, but you won't be particularly impressed either. To enjoy this film you should be: a fan of the TV series 24. Vantage Point was released in the UK on 7th February 2008.